We spent a few days at Live Oak Ridge COA and had a wonderful time. 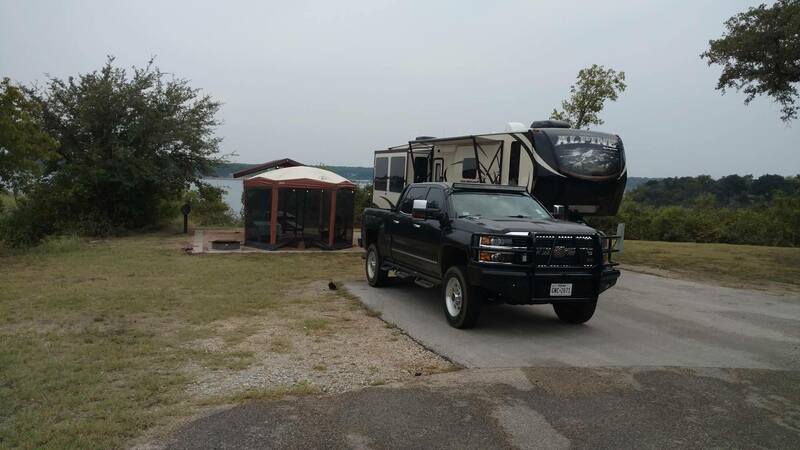 It’s located on Lake Belton, about an hour north of here, so is easy to access for a weekend outing. We chose campsite 1, which ended up being perfect. It was easy to get into, had a great view of the lake, and a trail leading down to the waterfront. Even though the park was full, the waterfront below our site had very little traffic and we had it to ourselves the majority of the trip. The site itself had a very nice, crushed granite pit with a concrete slab in it for the firepit and ground grill, a second grill/smoker up on a stand, and a very large covered picnic table. We were able to set up our new Coleman canopy on the gravel and have plenty of room to move around. It’s definitely a place and site we will be returning to. Just prior to leaving on this trip, I diagnosed my passenger battery as having failed and replaced both of the OE batteries on my truck with Northstar AGMs. The OE batteries should be covered under warranty, but the two Chevrolet dealers I have contacted about having them replaced have failed to call me back, even after two weeks of waiting. I’m going to have to just take them in and annoy them until I get replacements, it seems. I’d like to put them in the RV to expand the battery array for dry camping. Regarding the AGMs, they’re a much better choice for my power load and driving habits, and should last three times as long as the wet cell batteries that failed (first one dropped to ~6V with a 100A load, second drops to ~10V and which is pretty much failed; these left me stranded twice before I got around to testing and replacing them). I just renewed the registration on both the truck and RV and am considering filing for Amateur Radio plates. They cost nothing, but will have my radio callsign on them, and you can use the same plate number on up to five or six vehicles (I don’t remember which) in the state of Texas. That means a single, easy to remember plate number for both the truck and RV that would ease the check-in process at most parks that require both.